The first translation made for this book was actually not from Russian to English. It was a visual translation. When Tatyana Yassievich discovered the letters, she made a series of watercolours. With this work she created a visual, emotional language for her research on her grandfather and the letters he wrote while defending Leningrad. When Tatyana exhibited the watercolours combined with a selection of the letters, it revealed that even a greater audience could be addressed, not only in Russia, but elsewhere. As a graphic designer, I got the opportunity to make one more translation: of the many layers of Tatyana’s and Nikolay’s artistic work, and of Nikolay’s letters into a book. I did not want the book to become an artist catalogue. I did not want to create a textbook. I wanted the book to be both – show Tatyana’s and Nikolay’s paintings with high quality, and at the same time give the reader space to discover the letters, to become truly immersed in the dialogue between granddaughter and grandfather. That is why the size of the book is large enough to show watercolours and paintings large scale, and small enough to hold the book while sitting in an armchair, forgetting your surroundings. The rhythm of the book is defined by very different kinds of chapters. The prelude consists of the watercolours Tatyana painted when finding and reading the letters. The main chapter with the letters is divided by a number of striking quotes combined with a selection of facsimiles of letters and postcards. They reveal the differences in the tone and content of the letters to the different people he wrote to, and his changing moods. Another chapter shows Nikolay Yassievich’s portraits of the family members to whom he’s speaking in his letters. Two portraits Nikolay made of his wife, Frida. There is a concise biography of Nikolay, written by Tatyana Yassievich, illustrated with a selection of paintings and photographs from the family archives. The closing chapter contains a series of watercolours in which Tatyana revisits the places described in the letters. The map, created specially for the book by Zhenya Pashkina, is always there to help readers understand the situation Nikolay and the others found themselves in. I hope that however you read the book, whether simply browsing and skipping from part to part, or looking at the paintings, or reading it carefully, page by page, that you will find yourself immersed in the story, as it is told by Nikolay and Tatyana. 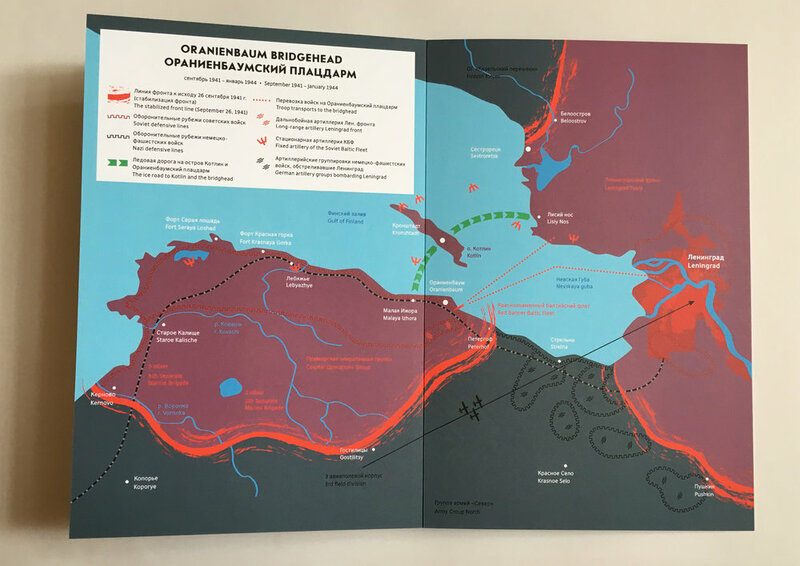 Map of the Oranienbaum Bridgehead created by Zhenya Pashkina.